I read a lot about how the brain learns and remembers. Why? Because I find it absolutely fascinating. I also want my students to learn, so I'm always searching for ways to help them remember what I've taught. There's plenty of evidence out there to prove that frequent review and practice is the best way for children to remember what they're learning. There's also plenty of evidence to prove that connecting the learning to the passions of the children help the learning process as well. So, what does this have to do with baseball? That's the passion that I connect to learning geography! I write a letter every morning to the children, letting them know of anything special happening that day. I also post the learning targets of the day. 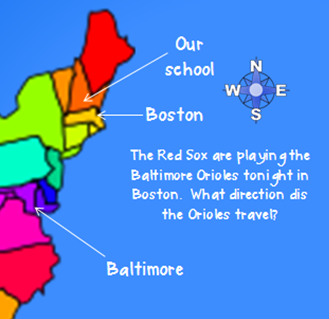 Then I usually put in some fun little question and/ or graphics: you know, to motivate the kids to read the letter! insane loyalty of Red Sox fans! Here in New Hampshire, we are die hard Red Sox fans. Those of us who grew up in the Boston area have developed a loyalty that we just can't shake. 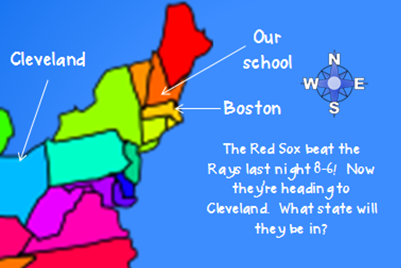 Since the official start of baseball season a couple of weeks ago, I've been writing a little "Red Sox Geography" question in the morning letter, complete with a map and labels. I admit, I'm as almost as passionate about geography as I am about the Red Sox. 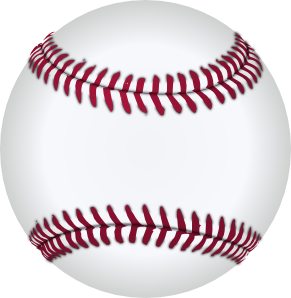 If the little ones aren't baseball fans when they come into my class, they certainly are by the time they leave! I make sure we have plenty of maps around, and the children scramble to be the first one with the answer! It's just a little bit every day, but they become familiar with the names of the states, the bodies of water, and the cardinal directions. The timing is good, since their reading skills and their mapping skills are strong enough for these activities by April, and since we won't get out until the last week of June, they'll be getting almost daily practice! Want to know more about brain based learning? 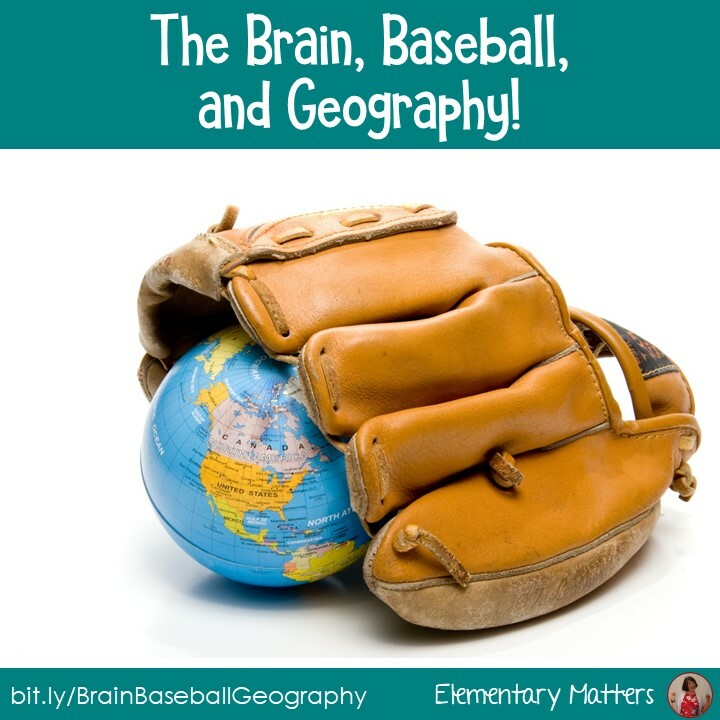 See Ten Brain Based Learning Strategies or 10 Key Brainy Points. 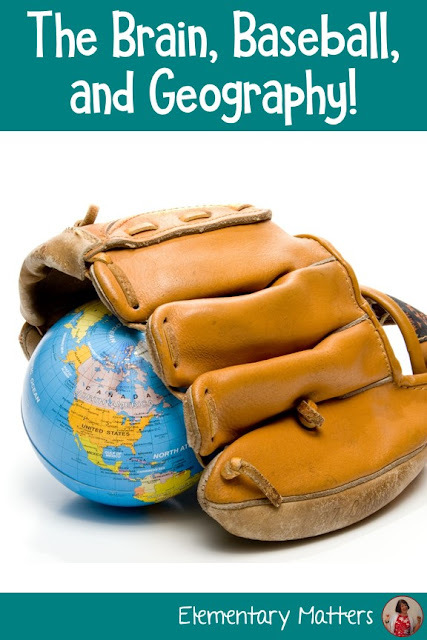 See also this resource with Geography Baseball Task Cards! I love this! And Fever Pitch is one of my favorites! Love me some Red Sox!! Geography is definitely one of my favorites too. What a great way to motivate kids. Go Red Sox!